As you might already know, the REUZEL Red and Blue hair pomades where early contributors to my spiritual conversion and rebirth into the pomade movement. In that light and over the course of the Style4men.ca journey I have aimed to try as many if not all of the REUZEL products. Why, you might ask? I like the presentation, performance and price point. Those aluminum cans and that pig totally rocks! And the goo inside those jars, rocks even more! At Style4men.ca we believe that grooming and making yourself presentable should not require you to skip a meal or miss a car payment. 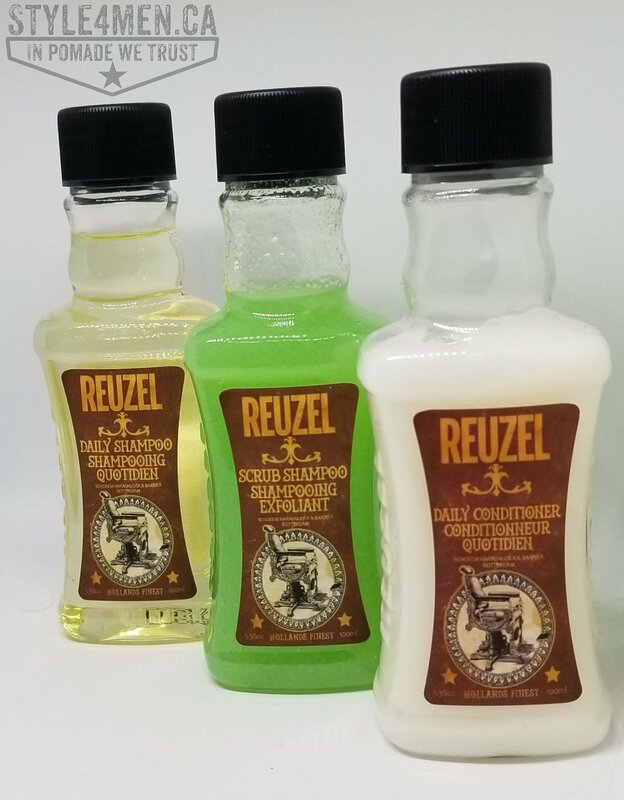 REUZEL consistently makes grooming products that meet our needs and that is why we love trying anything and everything coming out of the Schorem Barbershop in Rotterdam. . Click here to access all REUZEL Reviews. Some months ago I reviewed the REUZEL “Daily Shampoo”…actually that was a year and half ago! Time flies when you are having fun! Thank you to you all for coming by and reading our blogs. 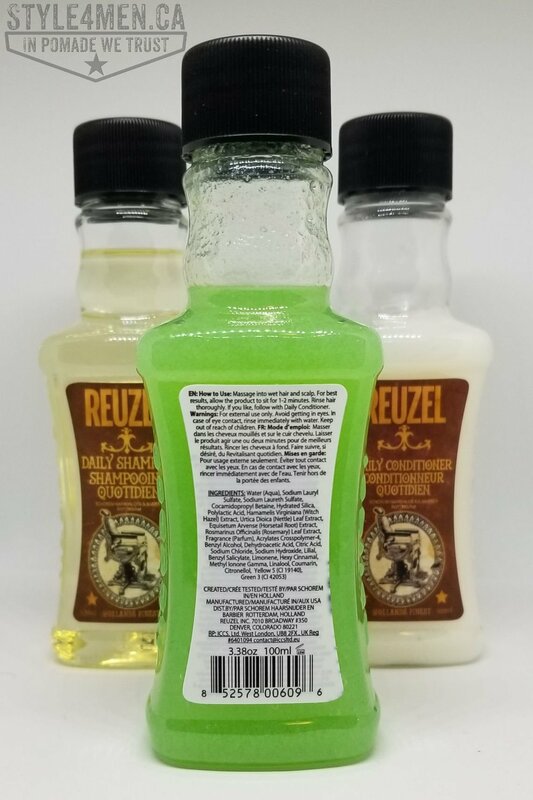 As I was writing, a while back we got to try the REUZEL Daily shampoo. At the time I did not have the companion conditioner and couldn’t attest to the full REUZEL shampoo + conditioner experience. 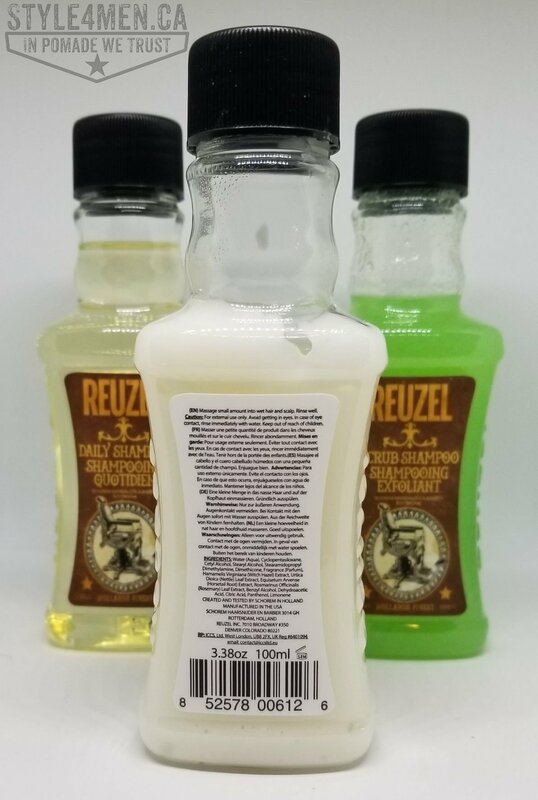 Thanks to our friend Marta at REUZEL who was kind enough to remedy that situation by sending us a set of the REUZEL shampoo and conditioner line. What is a Scrub shampoo?!?! We will get to that very quickly – worry not! First off, I will not cover the Daily Shampoo in this post as this was already done and you can read all about it here. Suffice to say that I had found the Daily Shampoo to be a deep cleaner and for my long’ish uppercut, following up with a conditioner treatment was a must. So what is this “Scrub Shampoo”? In simple terms, it is a shampoo that contain grit like elements that will serve to help the washing process by exfoliating any harder to dislodge dirt. such a concoction in the shampoo space is new to me, but it is a rather popular face wash solution. you might also be familiar with this type of product as a hand cleaner. It is a staple in every Mechanics shop. Obviously the shampoo is more subtle than the mechanics version, but you get the idea. Between you and I, that green shampoo is very original and inviting. Let’s jump right into the testing of this Scrub Shampoo. The job at hand was to wash out 2 days’ worth of water based pomade. In other words, a perfect opportunity to see what this exfoliating shampoo could do. Once my hair was wet, I portioned out about a nickel size of the green shampoo. My nose was pleasantly tickled by a fresh citrus-lime aroma. Something I don’t remember encountering in a shampoo before. I loved it! Onto the wash! The shampoo suds up very nicely and was easy to work with. As indicated, this is an exfoliating shampoo so that means that there are some crunchy elements in there to help exfoliate extra dirt and residues. It feels very much like an exfoliating face wash, but it quite agreeable. Once the wash was done, it rinsed out nicely leaving no gritty elements behind. I will venture that if you are washing out a grease based pomade, the exfoliating elements will simplify the process. the same will be true for removing any serious dirt. I have to indicate that it is a very deep cleaning shampoo. This means that everything will be washed out and that your hair will be left squeaky clean. Squeaky clean is somewhat of a double edge sword. If your hair is really dirty or full of gunk, this is without a doubt an excellent option. That being said, this would be overkill on a daily basis unless you work in a coal mine. Because it is such a good cleaner, it will strip everything out of your hair including the good oils that serve to protect both your hair and scalp. Squeaky clean also means that your hair will be hard to work with if you don’t follow that wash with a conditioner treatment. If your hair is shorter than 3-4 inches, you won’t be bothered one bit, but in my case that undercut is some 6-7 inches long on top. For that length of hair, squeaky clean equates a tangled mess that is very unpleasant to comb through if not managed by a strong conditioner. Combing through a tangled mess can often result in some hairs being pulled out. I am at a later stage (40’s) in life and every hair means something to me. The men in my family go bald somewhere in their 30’s, so in that light I am blessed and do as much as I can to keep things as they are. In that light, I am extremely picky on shampoos, considerably more so than most guys. In that light I generally use milder shampoos. An observation: When washing your hair, it is important to scrub gently. When wet, your locks are vulnerable. You are not polishing off some cooked-on wax on a car. Aside from genetics, the way you tackle your hair could be affecting how long it’s going to stay with you. No need to go full wrestlemania on it! Another observation that I will call a “tip”: You don’t need to wash you hair every day. Read that last line again! As guys we tends to want to make sure we are clean and might in fact be drying out our hair and scalp by over doing it. It’s in fact a good idea to give your hair a break and wash every other day. If you are a water base pomade user, you can simply rinse it out under the shower head without using shampoo. You might be surprised by the results of simply using a conditioner and skipping the shampoo all together. It will restore some much needed moisture in that party zone. If you are washing your hair every day in order to have a workable canvas for your style and can’t achieve that without a shampoo, I was there too and found that using a salt or texturizing spray to soften the leftover pomade created the perfect condition to restyle without having to shampoo every day. OK enough, back on track buddy! This brings me to the REUZEL Daily conditioner. In my humble opinion, a shampoo is only as good as its companion conditioner. The job of the shampoo is to wash all the gunk out and prepare the field for the conditioner who then has to restore some life and oils back to this foliage. The REUZEL Daily conditioner is without a doubt a solid player. It took my hair from that squeaky clean stage to a considerably smoother finish. I let it in a few minutes while I finished my shower and then rinsed. It came out smoothly leaving just enough moisture and oils behind. Once out of the shower I dried my mope with a towel and then came the real test; combing. I was able to comb through without trouble…and lost no hairs. Nice! Alternatively and in my very limited experience washing out grease based pomade, I witnessed instant results dissolving the said grease by dumping a little shot glass of olive oil in my wet hair. This made it a breeze to then move on to the shampooing. 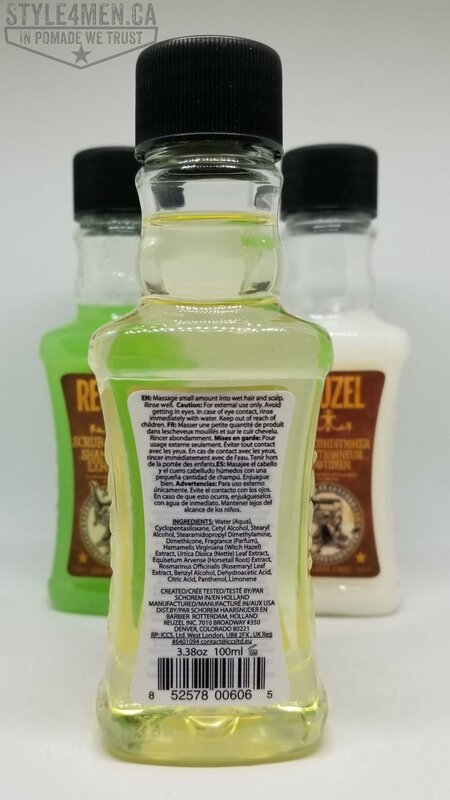 In closing, the REUZEL Scrub shampoo gets a ton of points from us for it’s fantastic scent and for its new application of exfoliating ingredients It is a hard working option that you might not need on a daily basis, but will be the perfect go-to bottle for those hard jobs. The companion conditioner has plenty of soul to bring your hair’s mojo back from that deep cleaning and you will be ready to rock another day.